Juvenile idiopathic epilepsy is found in Egyptian Arabian foals, who are born normal and appear healthy after birth. Researchers have found no genetic link between juvenile idiopathic epilepsy in Egyptian Arabian horses and four other well-recognised gene-based disorders known to affect them. The scientists involved in the study suspect there is a genetic basis for the condition, but the gene or genes involved have not been identified. Identifying them allow breeders to test breeding stock for their carrier status and help eliminate the disease. 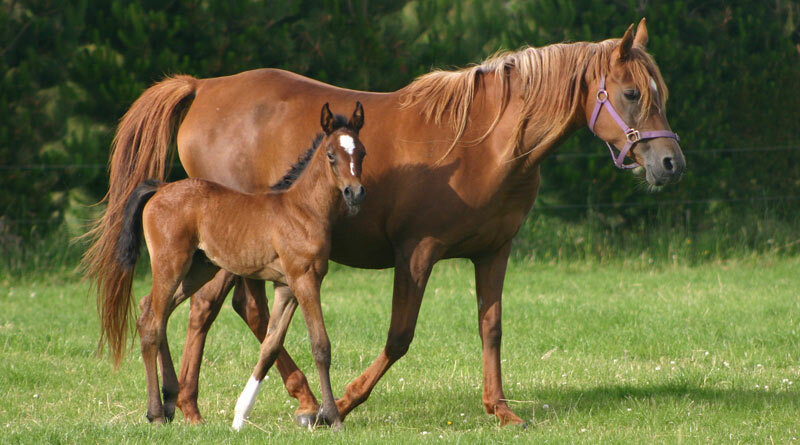 Juvenile idiopathic epilepsy is found in Egyptian Arabian foals. They are born normal and appear healthy after birth. The epileptic syndrome has an early onset of signs from a few days to six months of age. Generalized seizures typically start around two months of age and affected foals are clinically normal between seizures. There are no apparent triggering events for seizures, nor are there signs of underlying disease. It is a self-limiting syndrome, resolving over a period of months. It carries a good prognosis provided complications such as head trauma and aspiration pneumonia are prevented or treated properly. The outlook for athletic performance is also good. Monica Aleman and her fellow University of California, Davis, researchers said the condition resembled some neonatal and infant epileptic disorders in human medicine. They said that juvenile idiopathic epilepsy appeared to have a genetic basis, with affected animals typically having an affected parent, based on histories at breeding farms of Egyptian Arabians. Although a dominant mode of inheritance is suspected, a recessive mode has not been entirely excluded. The researchers set out to determine the carrier status of foals with the epileptic condition in relation to four other diseases caused by genetic mutations that are known to affect Arabian horses – lavender foal syndrome (LFS), cerebellar abiotrophy (CA), severe combined immunodeficiency (SCID), and occipitoatlantoaxial malformation (OAAM). The researchers were particularly interested in lavender foal syndrome, a lethal disorder of foals characterized by foals born with a dilute coat color and profound neurologic dysfunction. It is estimated that about 10.3% of Egyptian Arabians and 1.8% of non-Egyptian Arabian horses are carriers of the MYO5A mutation behind lavender foal syndrome. A study reporting foals with lavender foal syndrome had described a mare that produced a filly with the syndrome who also produced a filly with epilepsy when bred to a different stallion. Furthermore, a stallion that produced a filly with LFS also produced a foal with epilepsy when bred to a different mare. A possible link between the two disorders was considered. The study team carried out genetic testing on 10 Egyptian Arabian horses (5 females and 5 males) who had been diagnosed with juvenile idiopathic epilepsy by electroencephalography. All were negative for the genetic mutations that caused the other recognised problems, except for one foal that carried the gene for cerebellar abiotrophy. The authors, writing in the Journal of Veterinary Internal Medicine, said juvenile idiopathic epilepsy in Egyptian Arabian foals appeared to be a phenotypically and genetically distinct disorder – that is, an independent syndrome. Researchers found that juvenile idiopathic epilepsy was a distinct disorder, and unrelated to others that affect the arabian breed. There was no apparent association between the epileptic condition and the four gene-based disorders for which they tested. Discussing their findings, the authors said none of the horses with the epileptic disorder carried the MYO5A gene mutation responsible for lavender foal syndrome. However, because of the low number of foals with the epileptic disorder, a carrier state could not be entirely ruled out. “Furthermore, a report of two foals with periodic seizures born from parents producing foals with lavender foal syndrome warrants investigation,” they said. “These foals were apparently normal between seizures, similar to the confirmed foals with juvenile idiopathic epilepsy from a previous study. Another possibility, they said, was that the seizures in the two foals were clinical signs associated with lavender foal syndrome and they did not have juvenile idiopathic epilepsy at all.